Jerry Nolan [Beckfordiana]: "Ah Dear Comet..."
In the Notes Beckford associated the Kaf with the stone called sakhrat: at once the pivot of the earth, a vast emerald from which the heavens derived their azure and the reason for earthquakes when the stone moved one of its fibres. The Caliphs terror at the thought of the Kaf showed his failure to appreciate the terrible as a supreme form of the beautiful. The apocalyptic imagery in Beckfords writing during the years up to 1784 can be directly related to his early personal development. The young Beckford was essentially a precocious literary talent who, through London seasons and European travels, persisted in cultivating a considerable level of lonely defiance, self-absorption and arrogant contempt for his elders trapped by the importance of politics. Society was beginning to ensnare him. By 1784, Beckford as a married man became an M.P. for Wells and then quickly sought a barony with the title of Lord Beckford of Fonthill. Only scandal and disgrace were to prevent his ennoblement. When Lord Loughborough accused Beckford of corrupting the seventeen year old William Courtenay (the future earl of Devon), English society believed Loughborough and began treating Beckford as a pariah. Doubtless the doom-laden aspects of The Episodes of Vathek owed much to Beckfords increasing anxiety that from Loughboroughs human revelations may grow his own personal catastrophe. IN 1787, Beckfords family resolved to send him into exile to his Jamaican sugar estates via Lisbon. An ailing Beckford decided to go no further than Lisbon where he stayed for eight months, his first of three protracted visits to Portugal. The British Minister, Robert Walpole, refused to receive Beckford or present him to the court of the Queen of Portugal, Maria 1. By good luck Beckford was introduced to one of the Queens favourites, the Marquis of Marialva, who became Beckfords devoted friend and arranged for his limited entry into the aristocratic, diplomatic, ecclesiastical and royal circles of Portugal. Beckfords life-long gratitude to Portugal and St. Anthony, so well expressed in his journal entries for the period between May and November 1787, helped him to feel safe from his many English enemies. Beckford was in Paris on the 14 July 1789 when the Bastille fell. (7) Revolution had its apocalyptic appeal. Radical stirrings were expressed in anonymous pieces: Modern Novel Writing (1795) with Pitts England lampooned as The Isle of Mum; and Azemia (1797) with its angry castigation of the idle and wasteful rich who treated their horses and dogs better than their poor neighbours. Yet Beckfords imaginative sympathies with the climate of political revolution were not to be developed by him into further literary works. Instead he began to see himself as a patron of painters who would reflect the new age of catastrophe as the millennium approached. Commissioned apocalyptic pictures became an early important part of the plans for Fonthill Abbey whose buildings and landscaped grounds would be Beckfords highly ambiguous version of revolution in England. Beckfords patronage of West may well also have been linked to the fact that George III had commissioned West for an iconographical programme from Revelations in the Royal Chapel at Windsor. Wests first apocalyptic design for Beckford was probably St. Michael which had the Archangel shown with great wings, a golden cuirass and plumed helmet and his defeated adversary given bat wings, a subhuman head and a spiralling tail. In another sketch, A Mighty Angel Standeth Upon the Land and on the Sea, the Angel stood in a contraposto position with the rainbow above him, a book in one hand and an arm raised to heaven. A companion sketch for A Mighty Angel was The Beast Riseth out of the Sea which showed the Great Red Dragon passing the sceptre of power to the Beast, while a woman holding a child in her arms was beseeching mercy: a most grotesque depiction of the gross abuse of power. There was the sketch of The Woman Clothed with the Sun Fleeth from the Persecution of the Dragon with its vivid contrasts between the graceful beauty of the woman, baby and attendant angels, and the grotesqueness of the demonic forces erupting from below. A West design, probably intended as a cartoon for a painted glass window, was John Called to Write the Revelation; Wests John was an athletic young man with a quill in his right hand and a scroll in his left on an island beside an enormous eagle and before the vision of Christ, in the midst of the Seven Golden Candlesticks, commanding his young disciple to write. (10) The Angel in the Sun was the last of Wests apolacyptic sketches for Beckford. So DANBY finds, an artists fame. In 1835, Beckford chose to conjure up a picturesque idyllic landscape in his last book. In a fond vignette of Portugal, he celebrated the occasion of the Feast of St.Anthony by preferring Natures sky to a Church enclosure and by expressing a late iconoclastic tendency towards the liturgical tradition associated with Abbey Churches which he had once so admired. As he wrote about pharisaic gatherings in the Christian churches, Beckford was in a position daily to enjoy views from the Belvidere of Lansdown Tower: its windows opening out on superb views of the Wiltshire Downs, the Severn Estuary and the mountains of Wales. Unlike the young Beckford in the company of a Carthusian monk on the way to the Grande Chatreuse, retirement in Bath permitted Beckford and carefully selected guests (all well cushioned from storms) to relax in the proud position of the Belvidere. Images of storms and eruptions (which had expressed early rebellion against family tyranny and later identification with political and social revolution) preoccupied Beckford much less as an old man but there remained in his possession a West picture which seems to have reminded him of his lost, and at times heroic, battles. 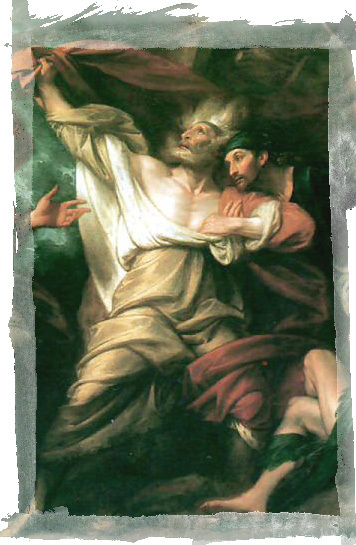 Henry Lansdown has reported that Wests sketch of Lear in the Storm: Act 111 Scene 1V (probably acquired after Wests death in 1820) was one of Beckfords favourite pictures in Lansdown Crescent. (24) Did Beckford perhaps catch a gleam of his own past energy and fire in Wests figure of the old King still defiant in the full force of the storm? Helmut von Erffa & Walter Staley, The Paintings of Benjamin West, 1986. Illustrations included are as follows: A1:396 (b & w);A2: 392 (b & w);A3: 109 (colour); A4: 393 (b & w); A5: 387 (b & w); A6: 398 (b & w); A7: 101 (colour). Morton D. Paley, The Apocalyptic Sublime, 1986). Illustrations included are as follows: A1: 43 (b & w); A3: 40 (colour); A5: 39 (b & w); B1: 175 (b & w); B2: 177 (b & w). M.F. Rogers Jr., Benjamin West and the Caliph in Apollo LXXX111 (1966), 420-5. 2. Beckford, Dreams, Waking Thoughts and Incidents, ed.Robert J. Gemmett, , 1971,283-4. 3. Beckford, Biographical Memoirs of Extraordinary Painters, 1977, 88. 4. Vathek and Other Stories, 57 & 106-7. 6. Beckford, The Episodes of Vathek ed. M.Jack, 1994, 206. 7. Boyd Alexander, Englands Wealthiest Son, 1962, 142. 8. The Diary of Joseph Farrington, ed. K.Garlick & A.MacIntyre, 1979 Vol.3 1091. 9. Life at Fonthill, ed. Boyd Alexander, 1957, 96. 10. See M.D.Paley, The Apocalyptic Sublime, 1986, 35-47. 11. Faringtons Diary, Vol.3, 912. 12. H.V.Lansdown, Recollections of the late William Beckford 1893, 13. 13. J.Storer, A Description of Fonthill Abbey, 1812, 18-20. 14. G. Grigson, The Harp of Aelous, 1974, 69-78. Beckfords comment on Martins The Capture of Babylon was: Oh, what a sublime thing! in Life at Fonthill, 279. 15. See The Apocalyptic Sublime, 172-181. Also a copy of the advertisement for the exhibition of Danbys Sixth Seal at the Bristol Institution, Park Street in 1835. 16. Life at Fonthill, 107. 17. See Boyd Alexanders Englands Wealthiest Son for comment on Beckford as slave-owner, 151 & 207-219. 18. See The Apocalyptic Sublime, 176-7. 19. For information about public incidents in connection with Danbys Sixth Seal before it was acquired by the National Gallery of Ireland in 1871, see the Danby Tate catalogue ,99-100 and the archives of the NGI. 20. Recollections of an Excursion, Centaur edition 1972, 189. 21. See Edmund English, Views of Lansdown Tower, Bath 1844, 7. 22. Lot 97 on the Seventh Day. 23. Liber Veritatis, edited by Guy Chapman, was eventually published in 1930 and remains little understood..
24. Recollections of the Late William Beckford, 13. Also see Lewis Melville, Life and Letters of William Beckford, 1910, 294.